A celtic sword is approximately 30 inches in length with a 23 inch blade which is double edged and features a blood groove, the blood grove allows for more flexibility while maintaining its strength. There are two types of Celtic sword, the “long” sword and the “short” sword. 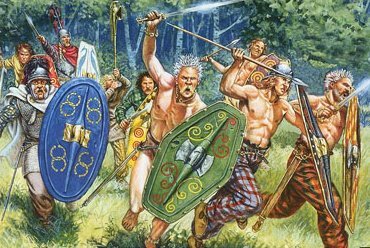 It was during the roman occupation of england that the celts found themselves in roman workshops and learning new skills for producing swords and the celts where known to produce some of the longest swords In history some measuring 6 feet in length. The long sword is most commonly known for it’s anthropomorphic hilt, this is often made of an organic material such as horn, bone or even wood. In front of the guard was often found an iron plate shaped to match the mouth of the scabbard. The scabbard was suspended from a belt made of iron links. The short sword’s only difference was that it had an abstract or anthropomorphic hilt made out of copper alloy. 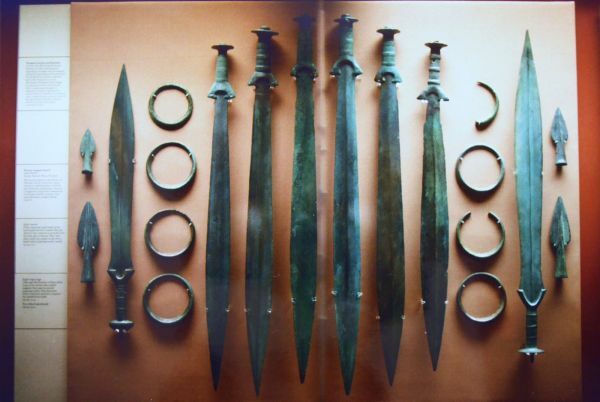 The celts would often decorate the hilts with Amber, ivory or gold leaf as they put a high price on fine weaponry. The celts where the first people to give their weaponry names, the most famous example of this being the legendary excalibur sword of king Arthur. Another first for the celts was the placing of weaponry in sacred lakes to honour the dead, today rivers and lakes are the best source of this sort of artefact.